Every day, your kitchen is exposed to a dose of new germs and foodborne bacteria, so it would do you and your family well to keep this room clean at all times. Forgetting to wipe down countertops after prepping raw food, not to mention cooking with oils and grease is unhygienic and can create a breeding ground for those nasty pathogens. Think about that the next time you make a meal; sitting right beside that delicacy are millions of disease-causing contaminants. It’s not a pretty picture, but we all need to be aware of the potential risks. The same goes for keeping appliances, utensils, cabinets, and cutting boards clean and sanitized, too. Following a few, simple tips can significantly reduce the number of bacteria living in your kitchen, and ensure your family is not consuming bad food nor spreading germs. 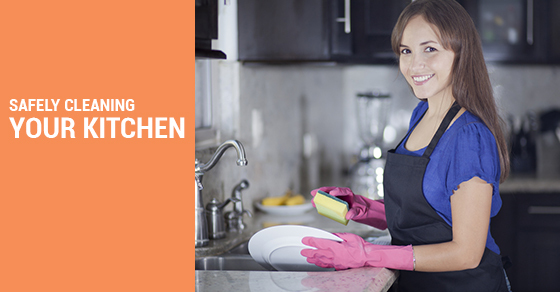 Wash your countertops and cooking utensils in hot, soapy water immediately after each meal. Even on days that you do not cook, still make it a habit to wipe the counters. If you want to go beyond and remove any doubt that these items are sanitized, mix one tablespoon of unscented bleach into a gallon of boiling water. Those stubborn germs will stand no chance upon coming into contact with this tried and true cleaning arsenal! Most modern dishwashers have sanitizing features as well, so be sure to activate this setting every time you wash a load of dishes. Too many people fail to recognize the risks associated with frequently re-using sponges and washcloths. A sponge is an ideal spot for bacterial growth, as it provides the perfect, damp conditions for spreading germs. As a general rule of thumb, the moment these products start to smell, toss them in the garbage and replace with new. Each time you use a sponge, dry it thoroughly by placing it in the microwave or dryer for about 30 seconds. This will oust all moisture that would otherwise be used to harbor mold and mildew. For unsightly countertops stains caused by spills and grease, mix equal parts ammonia, hydrogen peroxide, and water. This solution will restore your counters to their original color, as well as eliminate any bacteria that may have been trapped beneath the surface when the spill occurred. Your kitchen has to remain clean in order to keep yourself, your family and your guests healthy. Think about cleaning your kitchen the same way you think about cleaning your teeth: It’s not exactly the most exciting way to spend your day, but it is a necessary part of your routine.